This is a really good book because it is about this girl who likes to swim but finds out that she has leukemia and has to stop swimming. They take her to the hospital and she has to have a bone marrow test. A girl she met at the hospital said it hurts really bad and says to not look at the needle. Well the girl accidently looks at the needle and she starts freaking out becuase it was huge! So finally when it was over she says she will never do that again. And they tell her that she can go back home and that she can swim again and she is so happy! When i was younger i read this and many other books that i'm tracking down OVER AND OVER AGAIN!!!! !This one always brought tears to my eye's i thank a jennifer (who posted this title on a discussion) for leading me to it again!!!!! !It's a book that is definitely a keeper i wish i didn't move away so suddenly so i could have kept all my books and save's me the hassle of finding and buying them again!!!!!!!! Another book I read with my daughter. Since we had a death in the family from cancer a few years back, she started reading books that deal with death and illness. This is one of the happier of these book types. Read this book over and over and over as a teen, the writing isn't super, but it's meant for a young audience (and the writing level is TOTALLY appropriate for this age). It's a good book, addressing the scarier issues surrounding paediatric oncology without being too wishy-washy. How does it feel to have your life taken away from you at an age when you're just beginning to understand the world? Take it from the perspective of a young girl who discovers what she has can take her life, or take a lifetime curing it. This book is about a girl who is diagnosed with cancer and the journey it takes her on. I LOVED it! Leukemia is not what you would expect to be the cause of a little dizzy-spell at school, but for a young girl, who would really know how much it would change her life?A very humbling read. 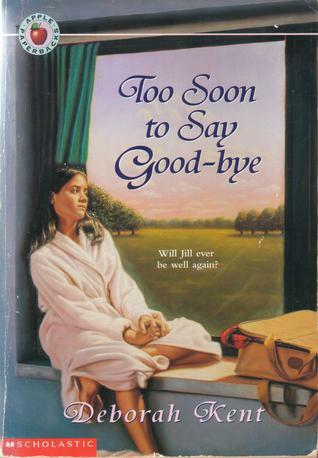 i only briefly remember this book but i do remember that it was a very good book. I read this expecting a lurlene McDaniel type of book. Not even close! Very different. It was good to have a happy-ish ending! I read this book in middle school and recommend it to everyone who likes books w/ these types of covers ;) But really, it's a good read.